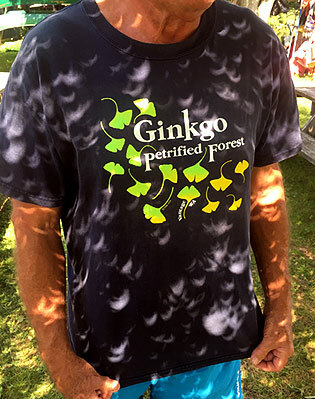 Peter Del Tredici standing under a tree with pin-hole images of the sun adorning his Ginkgo T-shirt. Partial eclipse of August 21 in Connecticut , the southernmost state in the New England region of the northeastern United States. Photo sent to me by Peter Del Tredici, Senior Research Scientist, Emeritus, Arnold Arboretum of Harvard University, Boston. More photos of Ginkgo and eclipse on my Twitter.